PSX Mega Man X6 (USA) in 25:34.02 by Rolanmen1 & FractalFusion. Capcom decided to make some easy money, so they recycled parts of Mega Man X5, threw in overly difficult trial-and-error gameplay, made almost everything an obstacle course, and called it Mega Man X6. This run by Rolanmen1 and FractalFusion plays on the hardest difficulty, Xtreme, and uses both X and Zero. 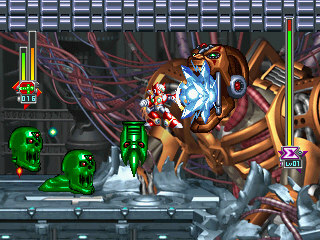 The physics of Zero's sword make it the ideal boss killer, however some bosses have unavoidable invincibility periods, so X is sometimes used to attack during these periods. Some new tricks like duck dashing and saber climbing help save 19 seconds over the previous movie. If you want to see a run that plays through all of the stages, see this run.